The volatility genie is out of the bottle again. As I’ve noted in the last few weeks, the global economy is slowing, perhaps heralding a global recession. Indeed last week’s news of increasing economic weakness in Europe and U.S. weakness in last Friday’s PMI data suggested that American economic expansion may also be rolling over. This made the Fed’s announcement of no more rate increases in 2019 more meaningful, causing three days of rapid up and down sizeable moves in the markets. But that’s the new normal. Only the headlines matter to the high frequency trading (HFT) trading algos. Moreover, algos respond to headlines at the speed of light while the Fed sleeps like Rip Van Winkle. Accordingly, the major indices whose individual component stocks are favorite vehicles for algo trading programs get clocked when there is bad news and rally in a major way when there is good news. Specifically, when news hits, the HFT algos react by buying or selling in the futures markets. Then “old fashioned” program trading by big hedge funds and trading kick in and the cash markets follow. This causes individual traders to jump in due to technical stops being hit and the ensuing changes in asset allocation trading models. Then the selling becomes systemic as everyone tries to cut their losses or maximize their shorts and the cycle repeats. As a consequence because HFT algos have preferential access to all exchanges, they often execute their trades before individual trades hit the market. The result is that when you and I sell, the algos see our orders as they arrive and sell their shares or sell shares short ahead of us creating a self perpetuating cycle which then feeds on itself as more trades come in. Only when there is short covering or actual buying on the dips at substantial levels does the general trend change as the algos, seeing the change in the order flow, flip to buy mode. In this case, they buy before you and I and are ready to sell at a profit when our slow poke orders finally hit the exchange. It’s all legal thanks to the SEC and was described in detail by Michael Lewis in his book Flash Boys. The point is that when the selling hits, in this market it doesn’t always stop easily, especially when there is no one willing to buy the dip. The reverse is true on the buy side. Furthermore since all the pros and experienced traders now know how the game is played, when bad news hits the wires everyone knows what’s likely to happen, so they sell or stand aside, which again makes the market thin and accentuates the down draft. This is why the bear market in the fourth quarter of 2018 was so vicious. No one was buying. Everyone was selling. And the algos accelerated the trend. From an individual portfolio standpoint, what used to be small losses can turn into bigger intraday losses since there is little buying support across the board when the algos hit the indexes. So even if your stock is fundamentally sound, the odds are that on that particular day, if the market gets hit, so will your stocks. Calendar : Federal Reserve speakers hit the trail as Regional Fed Business surveys hit the wires. U.S. GDP, housing and mortgage data along with consumer confidence surveys will be released. Key German, UK, Italian and French economic data is due out. ECB president Draghi will speak. Big Picture : The third year of the Presidential Cycle (2019) is traditionally bullish for stocks. But seasonality alone can’t hold up stocks. Moreover, central banks and governments are moving too slowly on fiscal, trade, and monetary policy and the markets are getting impatient. Questions of institutional competency are likely to be raised in the next few weeks to months if things don’t change. Risk : Headline risk remains. Think U.S.-China trade war, global tariffs, slowing economic data, politics. Market Behavior : Volatility remains tied to the headlines. Expect swift and until proven otherwise shallow pullbacks with buying of the dips. A reversal of this trading pattern would be very negative moving forward. What to do : Stay cool. Expect wild swings in the market. Hedge. Manage positions individually. Sell if your stops get hit. Get ready for whipsaws. The New York Stock Exchange Advance Decline line (NYAD) made a new high on 3/21/19 but rolled over aggressively on 3/22/19. On the positive side NYAD closed the week above its 20-day moving average which has been an excellent support level since the 2016 presidential election. Thus, if NYAD breaks below this key support in the next few days, as it did in Q4 2018, the odds of a more serious pull back will rise as the algo chain reaction will go into full deployment. Furthermore, if it breaks below its 50-day moving average the odds of even worse selling are very likely. The S & P 500 (SPX) closed at 2800 on 3/22/19. 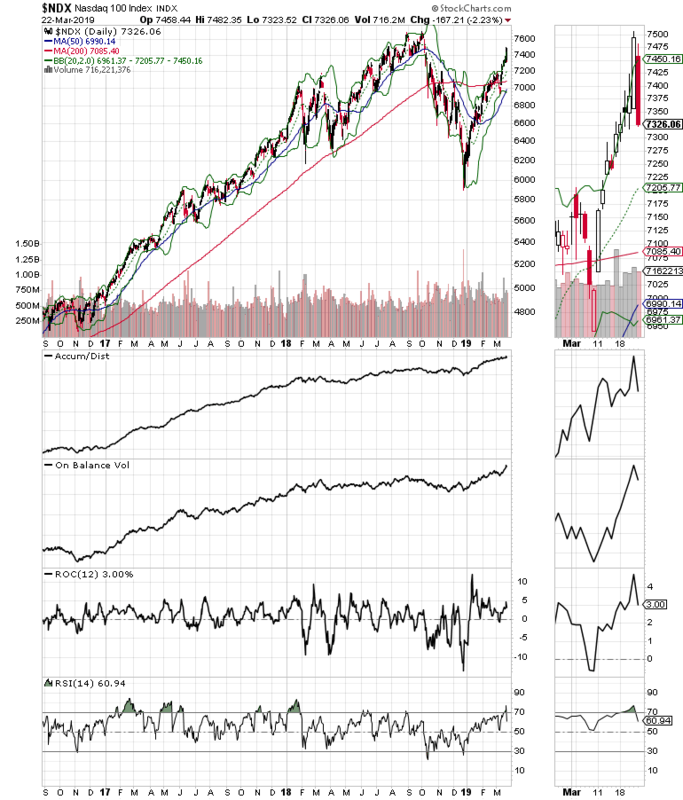 Unfortunately SPX is weakening at a faster pace than the Nasdaq 100 (NDX), which means that we may see at test of the 200-day moving average and the 2700-2750 support area before we can make better trading decisions about the long term. The Nasdaq 100 Index tumbled along with the, but the decline is not really surprising. 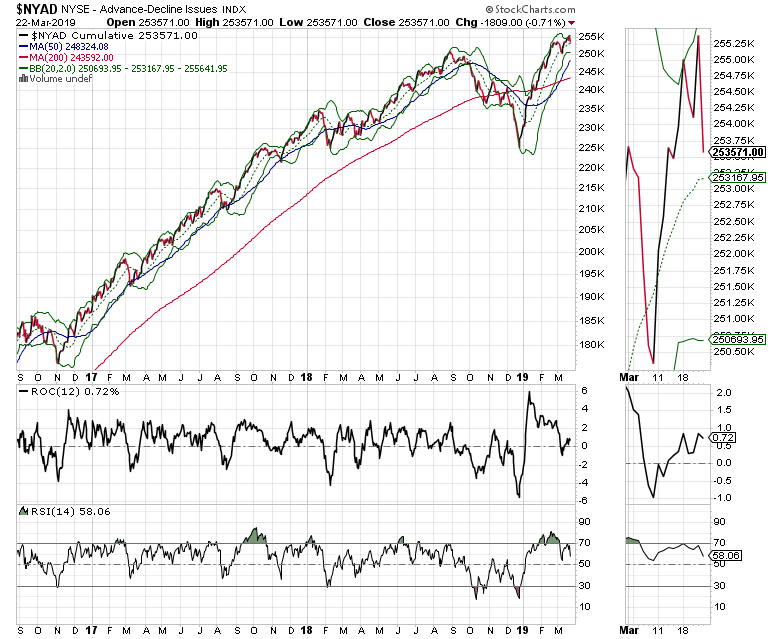 For one the index rallied in a big way on 3/22 and NDX closed above its upper Bollinger Band. That’s usually a sign that the market travelled too far and that a correction was likely. 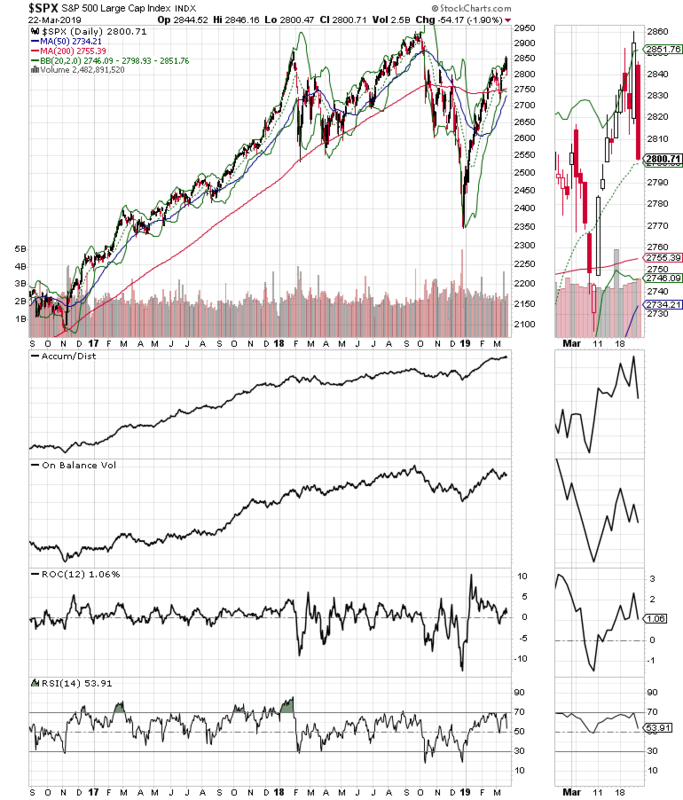 So for now, as painful as it will be to endure, the pull back is likely to remain in place until the 20-day moving average and the 7200 support levels are tested. Since HFT trading is legal, there is nothing anyone can do about it except to adjust. Indeed you have two choices, make the most of it or quit trading. Here is the bottom line. Because algos are digitally precise and relentless, it’s important to expect wild market swings and to focus trading on key technical support and resistance levels such as the 20, 50, and 200 day moving averages when making long term buy, sell, and hold decisions. In this market, focusing on the New York Stock Exchange Advance Decline line as a macro trend indicator and managing each individual stock or ETF position separately from others is a good place to start portfolio decision making. Furthermore, by using options as a hedge you could buy yourself more decision making time. No matter what, because individual investors can’t act as rapidly as HFT traders, it is likely that portfolio swings in your portfolio and mine, to the up and the down side, will be larger than we were used to in the past. As a result, a successful trading day in this market may be one in which you still have some money left in your account. But don’t fret too much. Tomorrow there will be more headlines. And here is just a bit of cold comfort to dwell on. While the Fed naps Algos never sleep. The flip side is when the Fed finally caves in and eases, the algos will read the headline and buy stocks like there is no tomorrow. Joe Duarte has been an active trader and widely recognized stock market analyst since 1987. He is author of Trading Options for Dummies, rated a TOP Options Book for 2018 by Benzinga.com - now in its third edition, The Everything Investing in your 20s and 30s and six other trading books. Preorder the second edition now of The Everything Investing in your 20s & 30s at Amazon and The Everything Investing in your 20s & 30s at Barnes and Noble. To receive Joe’s exclusive stock, option, and ETF recommendations, in your mailbox every week visit https://joeduarteinthemoneyoptions.com/secure/order_email.asp.